Facing consecutive road games for only the second time all year, Michigan heads to Iowa City to take on the struggling Hawkeyes. If you were wondering, the last time that Michigan won consecutive road games in conference play was January 2003 with wins over Ohio State and Northwestern. Those wins were in the midst of a 13 game winning streak during Daniel Horton’s freshman year. Since their overtime debacle in Iowa City a year ago, Michigan has handled Iowa with relative ease in the last two matchups. First, a 28 point Big Ten tournament win which featured an impressive 27 point performance from DeShawn Sims. Next, a 14 point home win that was never really that close. 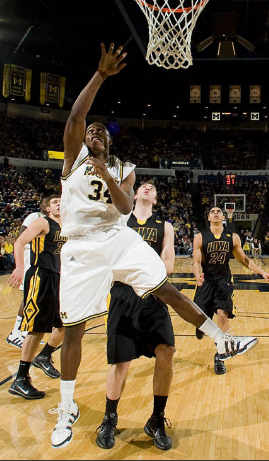 Michigan was led, once again, by DeShawn Sims who notched 20 points and 12 rebounds. More important than DeShawn Sims gaudy scoring totals is the fact that Michigan has locked down the Hawkeyes defensively. Holding them to 45 and 46 points in the last two games. It took Iowa 7 minutes to score their first field goal last time out and they didn’t break 20 points until the second half. Neither team has fared particularly well since the two teams faced off just over two weeks ago. 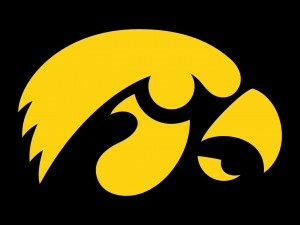 Iowa knocked off Northwestern at home but lost to Illinois and at Wisconsin and Purdue. Michigan lost two of their last three but they are coming off of an encouraging road win at Minnesota. Iowa still lives and dies by the three. They shoot 48.1% (3rd highest nationally) of their field goal attempts from three point range and knock them down at a 32.9% clip. Devan Bawinkal, Matt Gatens, Cully Payne, and Brennan Cougill are all good three point shooters that you don’t want to leave open. Beyond the three point shooters, the player I’m most worried about is Aaron Fuller. The 6-foot-6 sophomore averages 8.2 points and 5.9 rebounds per game but he is the one player on the Iowa roster who provides a mismatch versus the Wolverines; battling with Zack Novak at the four. Fuller had 16 points and 8 rebounds despite playing only 26 minutes due to foul trouble in the last game. Judging from the last two contests, the game plan for Michigan should pretty obvious. Establish DeShawn Sims down low early and defend the Hawkeyes’ three point shooting attack. Manny Harris and DeShawn Sims played probably their best two-man game all year at Minnesota, and if they can stay in sync versus Iowa that will bode well for Michigan. Statistically, even with Michigan’s struggles, Iowa just doesn’t match up with Michigan. Iowa turns the ball over a lot (22.3% of possessions) and doesn’t do anything particularly well on either side of the ball. They are actually best at defensive rebounding, however Michigan had their best offensive rebounding performance of the year in the last match-up. Michigan should roll in this one, but nothing is guaranteed on the road. 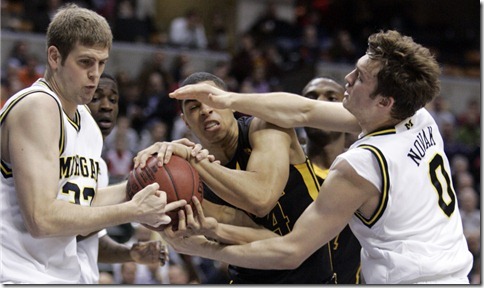 If Iowa gets hot from three point range they could make a run and surprise the Wolverines. Pomeroy likes Michigan by 3, giving them a 65% chance at victory. Vegas takes Michigan by 4. Let’s hear your thoughts and predictions in the comments. P.S. : Michigan is on 2011 super recruit Mike Gilchrist’s list of six schools along with Oregon, Villanova, Texas, Kentucky, and Georgia Tech. Villanova and Kentucky would probably be considered the favorites at this point.